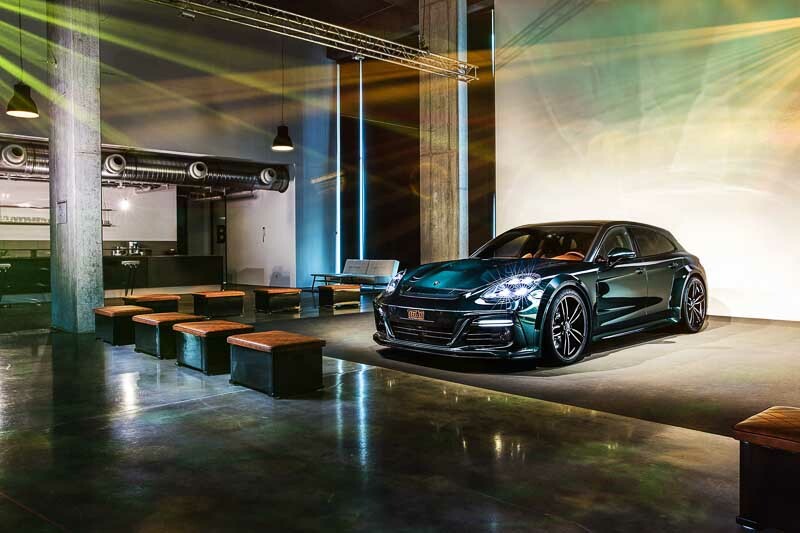 From March 8 to 18, Porsche drivers can gain an insight into the world of TECHART Premium Refinement and explore numerous new products of the Germany-based individualizion specialist. At center stage of TECHART’s stand in hall 2: the world premiere of the new TECHART range for the Porsche Panamera Sport Turismo. For the market launch, TECHART presents the GrandGT »Supreme«, an extraordinary signature edition which uniquely combines sportiness and luxury. The exterior is characterized by the new TECHART GrandGT styling package for the Sport Turismo models, 22-inch TECHART Formula IV wheels, a TECHART sport exhaust system with titanium/carbon fiber tailpipes as well as a custom painted car body in Racing Green. The inside is once again a masterpiece of the renowned TECHART interior manufactory. Already the choice of the leather hides of the GrandGT »Supreme« is unconventional. Key challenge for TECHART’s master craftsmen: the maintenance of softness and naturalness of the leather. And the result is overwhelming. They developed an un-embossed Nappa with a smooth and natural texture. The vegetable-tanned hides are free of chromium and are finished solvent-free. The ultra-premium leather covers the complete interior of the Sport Turismo, including the footwell and the door panels. Combined with numerous details such as the handmade multi-color stitchings, the customized TECHART sport steering wheel and custom painted trims in body color, the GrandGT »Supreme« interior is a very high-end luxury interior. Superior driving performance is granted by the TECHART TECHTRONIC engine power enhancement which boosts the Panamera Turbo’s power output to 640 hp / 470 kW. The maximum torque raises to 900 Newtonmeters. The easy-to-fit engine upgrade shrinks the gap between standstill and 100 km/h to 3.4 seconds. From this point it takes only 8.3 seconds more to cross the 200 km/h line. Additional TECHART Geneva highlights: the TECHART options for the Porsche 911 GT3, including a Carbon Fiber Sport Package as well as carbon fiber sport tailpipes, the TECHART GTstreet R Cabriolet based on the 911 Turbo S as well as the TECHART range for the Macan models including all kinds of refinement options and the TECHART powerkit for the Macan Turbo with Porsche Performance Package.